Peter Cavicchia got fired for spying on his bosses. He was a former US Secret Service agent in charge of running JPMorgan’s (JPM) employee surveillance program. His job was to make sure employees weren’t up to anything illegal, like insider trading. Although all big banks have surveillance teams, Cavicchia’s was different. It was one of the first to use data to inform its spying. His team read personal emails of employees… tracked GPS locations of work phones… trawled through internet history… and even transcribed employee phone conversations. It then fed all this data into special computer algorithms that could identify suspicious patterns of behavior… ones that simple surveillance would have missed. Cavicchia was fired in 2013 when JPMorgan’s top brass discovered he was spying on them, too. Today, using data to predict people’s behavior is BIG business. Whether you’re aware of it or not, you generate a lot of data every day. Every time you shop online, use your phone for driving directions, send an email, browse Facebook (FB), or watch YouTube… you’re generating data that savvy companies turn into cash. 25 years ago before any of this was around, the whole world generated just 100 gigabytes of data a day. That’s equal to downloading 30 HD movies. 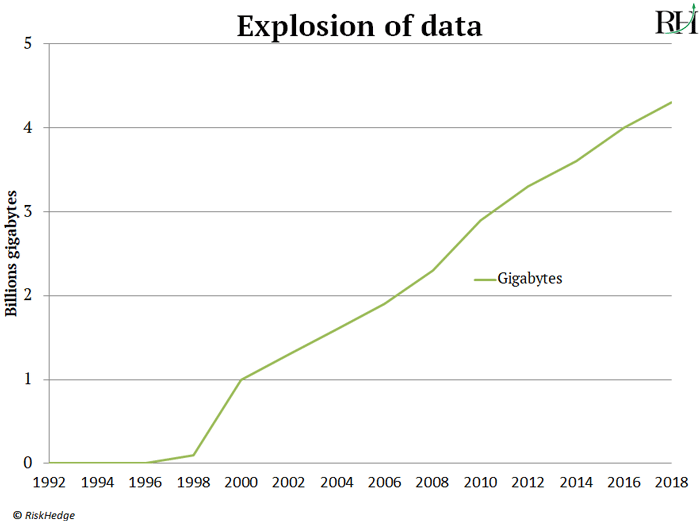 Today we generate roughly 4.3 billion gigabytes per day… which is a 4,300,000,000% explosion from 25 years ago! As regular RiskHedge readers know, today’s super-firms have made shareholders rich by collecting and interpreting data. Amazon (AMZN), Google (GOOG), and Facebook are three of the largest, most powerful companies on earth. Data is the lifeblood of their businesses. Take Amazon for example. Did you know that one in every three items it sells comes from its “recommended for you” tab? This is where it offers you items you’re likely to buy based on what you’ve bought in the past. This one strategy generated $36 billion in sales last year alone! That’s more revenue than fast food giant McDonalds (MCD) earned. 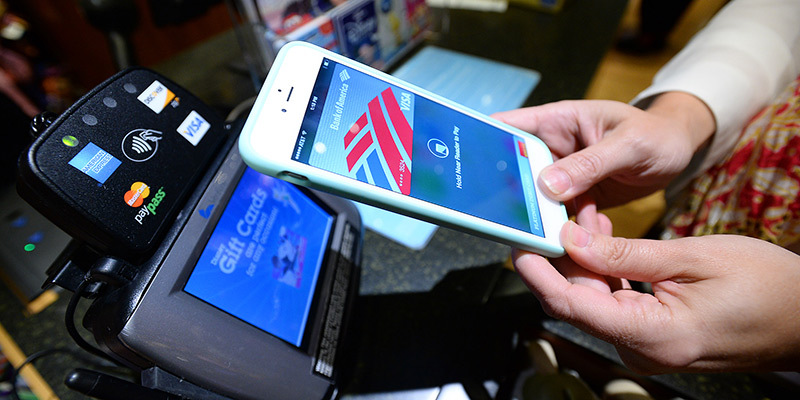 But while tech giants like Amazon and Google have figured out how to turn data into cash…. most firms don’t have a clue how to unlock the value in their data. Today many companies collect tons of raw data on their customers. But most don’t have the tools to make good use of it. You see, data is like oil. When oil is first sucked out of the ground, it’s a raw, useless muck. It only becomes useful when refined into gasoline to power our cars. Like oil, a big blob of raw data does you no good. Data must be refined and analyzed into valuable information. This year alone, companies will spend at least $50 billion on data analysis. Its platform gives companies access to powerful data tools previously reserved for the Amazons and Googles of the world. Internet giant Cisco (CSCO), for example, is a happy Alteryx customer. It used to take Cisco seven days to tally up all the money the company was spending on things like research and development. Its well-paid data scientists were wasting 90% of their time tracking down data rather than analyzing it to gain insights. Using Alteryx’s platform, Cisco slashed reporting time from seven days to 20 minutes. And by freeing up its data scientists’ time, it cut expenses by about 4%. Southwest Airlines (LUV) is a happy Alteryx customer, too. Over 150 million people took a Southwest flight last year. Southwest built a computer model to identify which of these folks are likely to use its frequent flyer program, and therefore become a repeat customer. It used to take Southwest eight weeks to update this complicated model. Using Alteryx, Southwest automated the whole process and saved $80 million. Alteryx counts some of America’s biggest businesses as its clients, including Wells Fargo (WFC), T-Mobile (TMUS), Home Depot (HD), Nike (NKE), and McDonalds (MCD). Alteryx’s sales have exploded 140% in the past two years. It went public in 2017, and in each of the past eight quarters, its sales have soared over 50%. Alteryx has doubled its customer base since 2016. And existing customers are spending more and more money. For every dollar a customer spent with Alteryx in 2017, it spent $1.30 in 2018. This puts its dollar “retention rate” at a world-class 130%. For comparison, this crushes even mighty Apple’s 92% retention rate. If you’ve been reading RiskHedge you know why autopilot stocks are ideal investments. In short, they earn heaps of recurring cash by selling subscriptions. Every one of Alteryx’s 4,300+ customers pay a monthly fee to access its platform. 95% of its sales come from selling subscriptions, giving it a constant stream of cash. As publicly traded companies go, Alteryx is still small. It’s worth $3.7 billion—too small for inclusion in the S&P 500. Meanwhile, it’s becoming a dominant player in the rapidly growing data analytics market. Leading research firm IDC estimates this market will be worth $81 billion in just three years. This combination—small firms disrupting large markets—is exactly what we look for at RiskHedge. 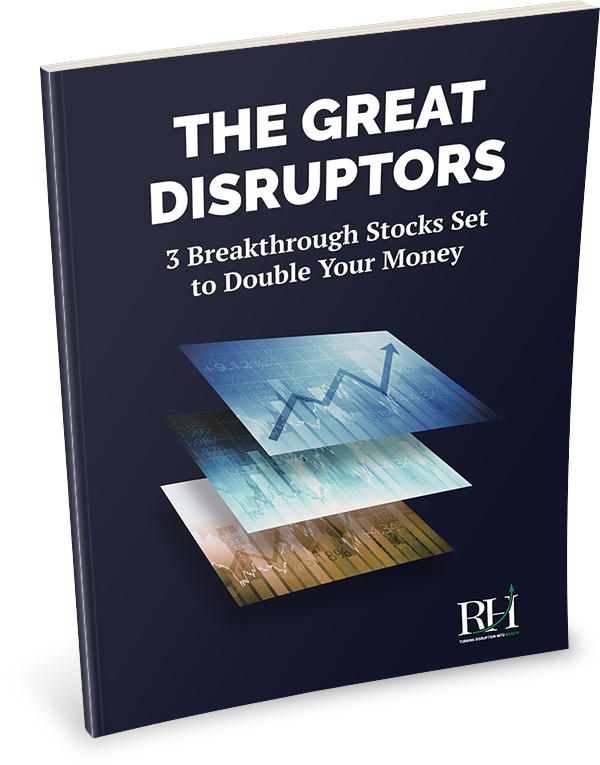 These are the kinds of stocks that could double or triple quickly and still have lots of room to grow. Alteryx is on track to rake in around $200 million this year. My research suggests it should double its sales over the coming two years. That would bring its total sales to around $400 million in 2020. If it achieves this sales growth, the stock should climb 100–200% by 2020. Alteryx stock has already soared 125% this year. It’s wise to be careful with any stock that’s run up so far so fast. But I’m comfortable taking a stake in Alteryx here. As you likely know, US stocks are having a rough year. On the Thursday you’ll get this letter, S&P 500 is down for the year and has slipped 12% since its September highs. Many widely followed stocks are down big, including Apple (-26%) and Netflix (-29%). Alteryx, meanwhile, is holding strong near its all-time highs. As you can see in the chart below, it’s sailed right through the selloff, as true disruptors often do. That’s all for today. 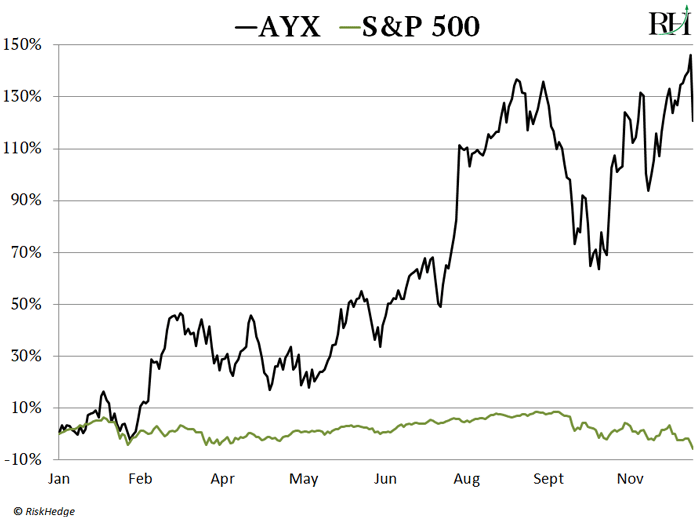 Are you nervous about the recent stock market selloff? Tell me at stephen@riskhedge.com. My husband and I both enjoy reading your letters and RiskHedge. We are both teachers and with that comes a limited salary. We would appreciate if you could write something for your subscribers who are starting out and only have limited funds to invest, such as a few thousand dollars. I know you deal with the big guys and huge funds, and it would be interesting to hear your perspective on what to invest in when you have limited funds. Elizabeth, thanks for your note. I’m glad you and your husband enjoy the RiskHedge Report. A great thing about “disruption investing” is you can get started with just a few thousand dollars. In the past 10 years truly disruptive companies like Amazon (AMZN) have turned a $1,000 investment into $27,000. And autopilot stock Adobe Systems (ADBE) has turned $1,000 into $8,500 in that time. When you’re starting out with a modest-sized portfolio, it’s key to keep your investment in any one stock small. You’ll often hear this referred to as proper “position size management.” It’s one of the most important but overlooked keys to profitable investing. I can’t give individualized investing advice, but here’s one smart rule of thumb. Limit your investment in any one stock to a maximum of 5% of your portfolio. So, if you have $5,000 to invest, don’t buy more than $250 of any one stock.